Thread: Can a Disco 4 tow a van with 350kg ball weight... I think not fit for purpose..
TBW does NOT have to be 10% of ATM! That figure came out years ago as a ballpark figure for trailer building/loading. It has never been included in any regulation that I am aware of. All the figures in the world, punched into the most advanced supercomputer don't mean diddly squat. What matters is what a weighbridge tells you. If you are not exceeding any of the required weights (GVM, GCM, ATM, tyre and axle weight limits), then you are fine. When you have it setup to those specs, get a copy of the weighbridge docket, and keep it in a safe place, for "just in case" scenarios. total bull**** Evo,, nothing is built to those dimensions,, towball to axle = X,, behind axle to end of van = X ..
its just a sales gimmick..
Trailerable yachts can get really close to that setup. Different to motor boats and caravans because the heaviest part of the load tends to be the lead in the centreboard and many trailer builders like to set up the trailer with the axles directly under that mass. Additionally many yachties like to try avoiding dunking the wheel bearings when launching/retrieving thus axles tend to be further forward than your standard caravan setup and more like the X/X setup in this demo. A 27 foot aluminium 3T trailer sailer I tow at times is like that (dual axle). It tends to wander due to less tow ball weight so much so that I’m now looking at trying to change its trailer setup to improve things. The axles are mounted to a cradle system to which the trailer chassis is then mounted. Clearly it’s all well secured but in theory the chassis could be moved further forward on the cradle for longer distance towing and then moved backwards for local towing work/launching/retrieving. Anyway, trailer sailer axles can look more like that setup once you put the boat on top with longer rear overhangs than you’d anticipate looking just at the trailer alone. 2000 TD5 Discovery auto 7 seater. Check me here please ... using moment calculations of weight x distance from axle to determine ball weight won’t work ... that’ll give you the torque applied to the axle by a given mass located somewhere along the chassis, not the added ball weight. For example, if the distance from ball to axle is say 4m and you have got a 40kg mass located 2m in front of the axle, using weight(mass) x distance from axle will give you a moment of 80Nm force acting on the axle in a rotational manner (torque) but doesn’t mean the ball weight has increased by 80kg (and clearly not 40kg either). 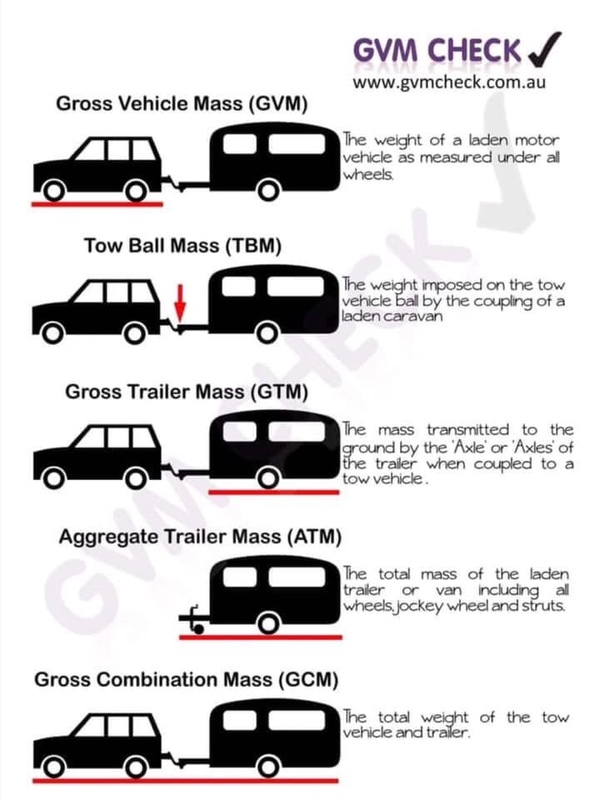 You’ll want to use a mechanical advantage calculation or similar to determine how much increase or decrease in ball weight placing masses in front or behind the axle will cause. You’d use load length/lever length x mass added ... eg 2m/4m x 40 kg = 20kg for the example above. Or just load up and visit a weigh bridge to know. Has the OP given actual weights from a bridge to help out here? I looked through the thread but couldn’t find any actual weights yet. Or buy on of these! I have one of those. Great kit. Mine is Milenco brand but looks identical. Cheers. Definitely need to use a row ball weight scale to get a real figure. I'm sceptical about the OP's calculation on a 350kg TBW. It seems too high to me, but the only way to be sure is to actually measure it.